Artist's conception of a magnetar, with magnetic field lines. Artist's conception of a powerful magnetar in a star cluster. A magnetar is a type of neutron star with an extremely powerful magnetic field. The magnetic field decay powers the emission of high-energy electromagnetic radiation, particularly X-rays and gamma rays. The theory regarding these objects was proposed by Robert Duncan and Christopher Thompson in 1992, but the first recorded burst of gamma rays thought to have been from a magnetar had been detected on March 5, 1979. During the following decade, the magnetar hypothesis has become widely accepted as a likely explanation for soft gamma repeaters (SGRs) and anomalous X-ray pulsars (AXPs). 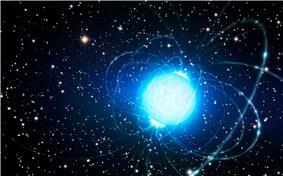 Like other neutron stars, magnetars are around 20 kilometres (12 mi) in diameter and have a greater mass than the Sun. The density of the interior of a magnetar is such that a thimble full of its substance would have a mass of over 100 million tons. Magnetars are differentiated from other neutron stars by having even stronger magnetic fields, and rotating comparatively slowly, with most magnetars completing a rotation once every one to ten seconds, compared to less than one second for a typical neutron star. This magnetic field gives rise to very strong and characteristic bursts of X-rays and gamma rays. The active life of a magnetar is short. Their strong magnetic fields decay after about 10,000 years, after which activity and strong X-ray emission cease. Given the number of magnetars observable today, one estimate puts the number of inactive magnetars in the Milky Way at 30 million or more. Starquakes triggered on the surface of the magnetar disturb the magnetic field which encompasses it, often leading to extremely powerful gamma ray flare emissions which have been recorded on Earth in 1979, 1998, and 2004. Magnetars are characterized by their extremely powerful magnetic fields of 108 to 1011 tesla. These magnetic fields are hundreds of millions of times stronger than any man-made magnet, and quadrillions of times more powerful than the field surrounding Earth. Earth has a geomagnetic field of 30–60 microteslas, and a neodymium-based, rare-earth magnet has a field of about 1.25 tesla, with a magnetic energy density of 4.0×105 J/m3. A magnetar's 1010 tesla field, by contrast, has an energy density of 4.0×1025 J/m3, with an E/c2 mass density >104 times that of lead. The magnetic field of a magnetar would be lethal even at a distance of 1000 km due to the strong magnetic field distorting the electron clouds of the subject's constituent atoms, rendering the chemistry of life impossible. At a distance halfway to the moon, a magnetar could strip information from the magnetic stripes of all credit cards on Earth. As of 2010, they are the most powerful magnetic objects detected throughout the universe. As described in the February 2003 Scientific American cover story, remarkable things happen within a magnetic field of magnetar strength. "X-ray photons readily split in two or merge together. The vacuum itself is polarized, becoming strongly birefringent, like a calcite crystal. Atoms are deformed into long cylinders thinner than the quantum-relativistic de Broglie wavelength of an electron." In a field of about 105 teslas atomic orbitals deform into rod shapes. At 1010 teslas, a hydrogen atom becomes a spindle 200 times narrower than its normal diameter. The strong fields of magnetars are understood as resulting from a magnetohydrodynamic dynamo process in the turbulent, extremely dense conducting fluid that exists before the neutron star settles into its equilibrium configuration. These fields then persist due to persistent currents in a proton-superconductor phase of matter that exists at an intermediate depth within the neutron star (where neutrons predominate by mass). A similar magnetohydrodynamic dynamo process produces even more intense transient fields during coalescence of pairs of neutron stars. Magnetar SGR 1900+14 is in the exact center of the image, which shows a surrounding ring of gas seven light-years across in infrared light, as seen by the Spitzer Space Telescope. The magnetar itself is not visible at this wavelength, but it has been seen in X-ray light. When in a supernova, a star collapses to a neutron star, its magnetic field increases dramatically in strength. Halving a linear dimension increases the magnetic field fourfold. Duncan and Thompson calculated that when the spin, temperature and magnetic field of a newly formed neutron star falls into the right ranges, a dynamo mechanism could act, converting heat and rotational energy into magnetic energy and increasing the magnetic field, normally an already enormous 108 teslas, to more than 1011 teslas (or 1015 gauss). The result is a magnetar. It is estimated that about one in ten supernova explosions results in a magnetar rather than a more standard neutron star or pulsar. On March 5, 1979, a few months after the successful dropping of satellites into the atmosphere of Venus, the two Soviet spacecraft, Venera 11 and 12, that were then drifting through the Solar System were hit by a blast of gamma radiation at approximately 10:51 EST. This contact raised the radiation readings on both the probes from a normal 100 counts per second to over 200,000 counts a second, in only a fraction of a millisecond. This burst of gamma rays quickly continued to spread. Eleven seconds later, Helios 2, a NASA probe, which was in orbit around the Sun, was saturated by the blast of radiation. It soon hit Venus, and the Pioneer Venus Orbiter's detectors were overcome by the wave. Seconds later, Earth received the wave of radiation, where the powerful output of gamma rays inundated the detectors of three U.S. Department of Defense Vela satellites, the Soviet Prognoz 7 satellite, and the Einstein Observatory. Just before the wave exited the Solar System, the blast also hit the International Sun–Earth Explorer. This extremely powerful blast of gamma radiation constituted the strongest wave of extra-solar gamma rays ever detected; it was over 100 times more intense than any known previous extra-solar burst. Because gamma rays travel at the speed of light and the time of the pulse was recorded by several distant spacecraft as well as on Earth, the source of the gamma radiation could be calculated to an accuracy of about 2 arcseconds. The direction of the source corresponded with the remnants of a star that had gone supernova around 3000 B.C.E. It was in the Large Magellanic Cloud and the source was named SGR 0525-66, the event itself was named GRB 790305b, the first observed SGR megaflare. 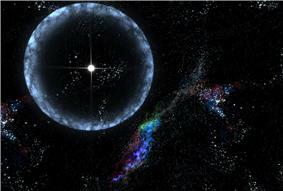 Artist's impression of a gamma-ray burst and supernova powered by a magnetar. On February 21, 2008 it was announced that NASA and researchers at  On September 1, 2014, ESA released news of a magnetar close to supernova remnant Kesteven 79. Astronomers from Europe and China discovered this magnetar, named 3XMM J185246.6+003317, in 2013 by looking at images that had been taken in 2008 and 2009. 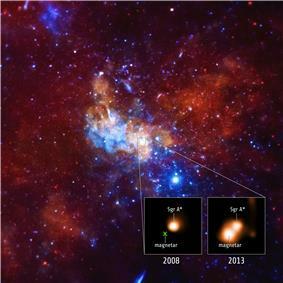 In 2013, a magnetar PSR J1745-2900 was discovered, which orbits the black hole in the Sagittarius A* system. This object provides a valuable tool for studying the ionized interstellar medium toward the Galactic Center. Often magnetars speed up (and more rarely slow down) and many of the reasons for this behaviour have not been fully explained by astrophysics. Astronomers have theorized that glitches occur when fluid inside the star rotates faster than the crust and suddenly transfers some extra momentum during a disturbance. They think the spectacular outbursts of x-rays occur in the 20 to 30 percent of glitches where the disturbance is violent enough to crack the crust. Because the strange 2012 outburst was accompanied by a slowdown, it has been called an anti-glitch. On 27 December 2004, a burst of gamma rays from SGR 1806-20 passed through the Solar System (artist's conception shown). The burst was so powerful that it had effects on Earth's atmosphere, at a range of about 50,000 light years. SGR 1806-20, located 50,000 light-years from Earth on the far side of the Milky Way in the constellation of Sagittarius. SGR 1900+14, located 20,000 light-years away in the constellation Aquila. After a long period of low emissions (significant bursts only in 1979 and 1993) it became active in May–August 1998, and a burst detected on August 27, 1998 was of sufficient power to force NEAR Shoemaker to shut down to prevent damage and to saturate instruments on BeppoSAX, WIND and RXTE. On May 29, 2008, NASA's Spitzer telescope discovered a ring of matter around this magnetar. It is thought that this ring formed in the 1998 burst. SGR 0501+4516 was discovered on 22 August 2008. 1E 1048.1−5937, located 9,000 light-years away in the constellation Carina. The original star, from which the magnetar formed, had a mass 30 to 40 times that of the Sun. CXO J164710.2-455216, located in the massive galactic cluster Westerlund 1, which formed from a star with a mass in excess of 40 solar masses. SWIFT J1822.3 Star-1606 discovered on 14 July 2011 by Italian and Spanish researchers of CSIC and Catalonia's space studies institute. This magnetar contrary to previsions has a low external magnetic field. 3XMM J185246.6+003317 Discovered by international team of astronomers, looking at data from ESA's XMM-Newton X-ray telescope. Magnetar found very close to the supermassive black hole, Sagittarius A*, at the center of the Milky Way galaxy. A recent progress in theory suggests that the energy deposition from these magnetars into the expanding supernova remnant could possibly explain some observed cases of unusually bright supernovae. Traditionally such bright events are thought to come from very large stars when they become pair-instability supernova (or pulsational pair-instability supernova). However, two papers published in 2010 by astrophysicists at the University of California, Berkeley, University of California, Santa Cruz and University of California, Santa Barbara provided semi-analytical and numerical models to explain some of the brightest events ever seen, such as SN 2005ap and SN 2008es. A research led by Matt Nicholl, of the Astrophysics Research Centre at Queen's School of Mathematics and Physics of Queen's University Belfast, the results of which were published on October 17, 2013 in Nature, has explained the newly discovered luminous transient PTF 12dam through the same mechanism. ^ a b c d Kouveliotou, C.; Duncan, R. C.; Thompson, C. (February 2003). "Magnetars". Scientific American; Page 35. ^ a b "Magnetars, Soft Gamma Repeaters and Very Strong Magnetic Fields". Robert C. Duncan, University of Texas at Austin. March 2003. Retrieved 2007-05-23. ^ a b c Kouveliotou, C.; Duncan, R. C.; Thompson, C. (February 2003). "Magnetars". Scientific American; Page 36. ^ a b c "McGill SGR/AXP Online Catalog". Retrieved 2 Jan 2014. ^ "HLD user program, at Dresden High Magnetic Field Laboratory". Retrieved 2009-02-04. ^ Naeye, Robert (February 18, 2005). "The Brightest Blast". ^ Duncan, Robert. "`MAGNETARS', SOFT GAMMA REPEATERS & VERY STRONG MAGNETIC FIELDS". University of Texas. Retrieved 2013-04-21. ^ Wanjek, Christopher (February 18, 2005). "Cosmic Explosion Among the Brightest in Recorded History". ^ Dooling, Dave (May 20, 1998). Magnetar" discovery solves 19-year-old mystery""". Science@NASA Headline News. Retrieved 17 December 2007. ^ Price, Daniel J.; Rosswog, Stephan (May 2006). "Producing Ultrastrong Magnetic Fields in Neutron Star Mergers". Science 312 (5774): 719–722. ^ Popov, S. B.; Prokhorov, M. E. (April 2006). "Progenitors with enhanced rotation and the origin of magnetars". Monthly Notices of the Royal Astronomical Society 367 (2): 732–736. ^ Cline, T. L., Desai, U. D., Teegarden, B. J., Evans, W. D., Klebesadel, R. W., Laros, J. G., (Apr 1982). "Precise source location of the anomalous 1979 March 5 gamma-ray transient". Journal: Astrophysical Journal 255: L45–L48. ^ "Biggest Explosions in the Universe Powered by Strongest Magnets". Retrieved 9 July 2015. ^ Shainblum, Mark (21 February 2008). "Jekyll-Hyde neutron star discovered by researchers]". ^ a b "The Hibernating Stellar Magnet: First Optically Active Magnetar-Candidate Discovered". ^ "Magnetar discovered close to supernova remnant Kesteven 79". ESA/XMM-Newton/ Ping Zhou, Nanjing University, China. 1 September 2014. ^ Chung, Emily (May 31, 2013). Extreme' star's sudden slowdown stumps astronomers"'". ^ Archibald, R. F.; Kaspi, V. M.; Ng, C. -Y.; Gourgouliatos, K. N.; Tsang, D.; Scholz, P.; Beardmore, A. P.; Gehrels, N.; Kennea, J. A. (2013). "An anti-glitch in a magnetar". Nature 497 (7451): 591–593. ^ "Glitches in a Neutron Star - Pt. 4". ^ "Strange Ring Found Around Dead Star". ^ Wood, Chris. "Very Large Telescope solves magnetar mystery" GizMag, 14 May 2014. Accessed: 18 May 2014. ^ Kasen, D.; L. Bildsten. (1 Jul 2010). "Supernova Light Curves Powered by Young Magnetars". ApJ 717: 245. ^ Woosley, S. (20 Aug 2010). "Bright Supernovae From Magnetar Birth". ApJl 719 (2): L204. ^ M. Nicholl, S. J. Smartt, A. Jerkstrand, C. Inserra, M. McCrum, R. Kotak, M. Fraser, D. Wright, T.-W. Chen, K. Smith, D. R. Young, S. A. Sim, S. Valenti, D. A. Howell, F. Bresolin, R. P. Kudritzki, J. L. Tonry, M. E. Huber, A. Rest, A. Pastorello, L. Tomasella, E. Cappellaro, S. Benetti, S. Mattila, E. Kankare, T. Kangas, G. Leloudas, J. Sollerman, F. Taddia, E. Berger, R. Chornock, G. Narayan, C. W. Stubbs, R. J. Foley, R. Lunnan, A. Soderberg, N. Sanders, D. Milisavljevic, R. Margutti, R. P. Kirshner, N. Elias-Rosa, A. Morales-Garoffolo, S. Taubenberger, M. T. Botticella, S. Gezari, Y. Urata, S. Rodney, A. G. Riess, D. Scolnic, W. M. Wood-Vasey, W. S. Burgett, K. Chambers, H. A. Flewelling, E. A. Magnier, N. Kaiser, N. Metcalfe, J. Morgan, P. A. Price, W. Sweeney, C. Waters. (17 Oct 2013). "Slowly fading super-luminous supernovae that are not pair-instability explosions". Nature. 7471 502 (346): 346. Mereghetti, S. (2008). "The strongest cosmic magnets: soft gamma-ray repeaters and anomalous X-ray pulsars". Astronomy and Astrophysics Review 15 (4): 225–287. Schirber, Michael (2 February 2005). "Origin of magnetars". Naeye, Robert (18 February 2005). "The Brightest Blast". "SWIFT J1822.31606, stella irrequieta". Italiaglobale.it. 19 July 2012.